While Il Trovatore counts as one of Verdi’s most gripping scores, the libretto’s sprawling tale of love and vengeance is not without dramaturgical challenges. A staging by Philip Stötzl which opened at the Staatsoper Berlin on Nov.29 featured several first encounters with the opera. Anna Netrebko, who attended the premiere of the co-production with the Wiener Festwochen last spring, decided to make the performance her role debut as the lady-in-waiting Leonora. The sinister Conte di Luna marks a first for Plácido Domingo, better known for his portrayal of the troubadour Manrico during his heyday as a tenor. Staatsoper Music Director Daniel Barenboim had never tackled the score, and Stötzl—a film director by training who has mostly staged Wagner—also found himself on new terrain. Stötzl deals with the rapid jumps in plot and formulaic approach of Salvatore Cammarano’s libretto to a tragic love triangle in 15th century Spain by creating a series of caricatures. The action is confined to an open cube tilted downstage (sets by the director and Conrad Moritz Reinhardt), with doors on all sides for the characters to spontaneously emerge. The aesthetic creates a tone at once classic and comic: The count’s army frolics with spears and top hats, while Leonora and her confidante, Inez, twirl around in cartoonish blonde wigs and oversized bustles (costumes by Ursula Kurdna). Azucena and her band of gypsies appear as clown-like hooligans—wearing not rags but ruffs. The production is visually captivating from start to finish—with choreography by Mara Kurotschka to animate choral scenes such as the famous anvil number; expert lighting by Olaf Freese which casts colourful shadows in mirror-image; and video projections by fettFilm that transform the otherwise static set with optical illusions, dismantling the walls into a starry sky in the final scene. However, one could have done without the childish vignettes featuring the characters in miniature and fake blood dripping down the walls after Leonora has stabbed herself. Despite Stötzl’s tight emphasis on the inter-personal relationships of the opera, his tongue-in-cheek tone ultimately detracts from its pathos. It was hard to take Azucena, in an unusually youthful but powerfully sung portrayal by Marina Prundenskaja, seriously when she tells Manrico (Gaston Rivera) how she accidentally burned her own son. And despite Netrebko’s heartfelt delivery in the final scenes, there lacked a sense of tragedy when she dies at Manrico’s feet, followed by the troubadour himself. Perhaps because Stötzl emphasized fairy-tale farce over the primal elements of the story—class struggle, blood-thirsty revenge, the continuity of death and life—the characters remained trapped in a bubble of theatrical whimsy. The evening had its strengths and weaknesses vocally. 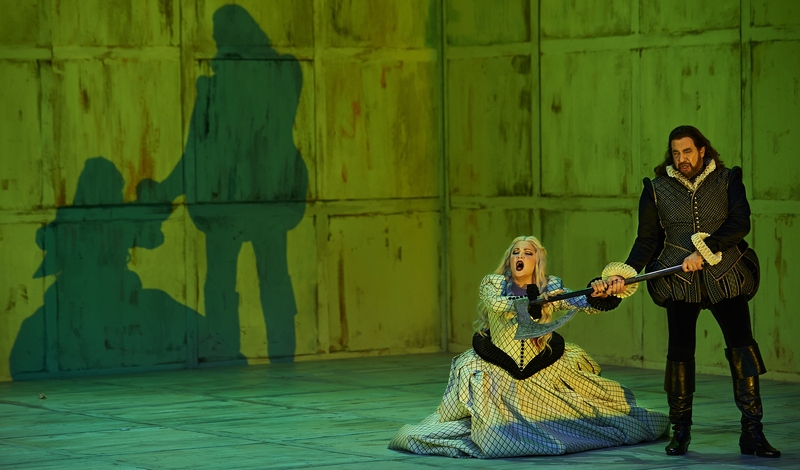 After warming up in the opening scenes, Netrebko was best in the full-blooded lines of ensemble numbers, such as when the count abducts her from a convent in the second act. But her hushed tones the Adagio “D’amor sull’ali rosee,” which she sings to the imprisoned Manrico, were brittle. Domingo struggled with the role of the Count—producing a raspy tone which left listeners worrying about his health—although his beautiful diction and sensuous phrasing remain intact. Rivera, stepping in for an ill-disposed Aleksandrs Antonenko, gave an admirable performance as Manrico, bringing a penetrating tone and agile lines to the cabaletta “Di quella pira.” The voice has a fast vibrato, however, that is not always attractive. As Ferrando, the count’s officer, Adrian Sâmpetrean brought a true basso profondo and excellent rubato to the opening scene in which he warns the troops about the troubadour. Staatsoper ensemble member Anna Lapovskaja gave a pleasant account of Leonora’s confidante, Inez. Barenboim led the Staatskapelle with gripping forward drive and elasticity of phrasing. The brass section was at times too Wagnerian, and tempo transitions such as that from Leonora’s exchange with Inez into the slow aria “Tacea la Notte” were not smooth, but his first take on the opera counts as a triumph. The Staatsoper Chorus, challenged by some of the precisely-timed choreography, was not as polished as it could have been in rhythm and diction, but the anvil scene and a-capella female number in the convent were beautifully delivered. This entry was posted on Friday, December 6th, 2013 at 9:36 am	and is filed under Berlin Times. You can follow any responses to this entry through the RSS 2.0 feed. Both comments and pings are currently closed.